John Breen appeared in The Rifleman six times ― The Safe Guard as a Townsman ― The Lariat as a Waiter. The Jailbird as a Townsman and The Clarence Bibs Story as a Townsman. John Breen started in films in the 1930s and worked steadily in movies through the early 1950s. 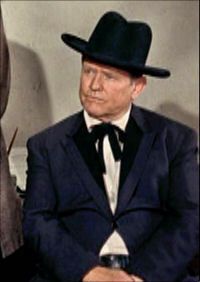 By the late 1950s he was doing television westerns appearing in many television episodes as waiters, and townsman working for the lower budget television companies like ZIV and Four Star Productions. He was an known for High Noon (1952) ― How the West Was Won (1962) plus several other feature movies. He has appeared in many TV Series such as Mission: Impossible ― Bonanza ― The Big Valley ― The Wild Wild West ― Cimarron Strip ― Gunsmoke ― Rawhide ― The Virginian ― Screen Directors Playhouse ― Adventures of Superman ― Bat Masterson ―Wanted: Dead or Alive ― Tombstone Territory. John appeared with Chuck Connors in Branded ― Very Few Heroes as a Courtroom Spectator.